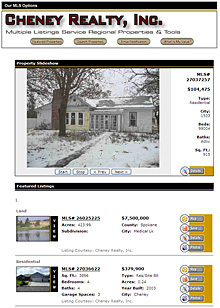 Cheney Realty, Inc. has been serving Cheney, Spokane and the greater West Plains area since 1957. Our Realtors have over 100 years of combined experience in real estate in this area, as well as decades of living and raising families here. We make it a priority to understand the needs of our clients to better serve them in searching for a property or selling their property. Cheney Realty Inc will provide you with the finest customer service and a clear understanding of what our local market brings. Please come in and visit, call or email our office with any of your real estate needs. We hope that you'll find our new website easy to use yet informative. Location, property, price... it's all right there. And if you need to talk to someone don't hesitate to call our office or any of our Realtors. Thank you for visiting. Please check back often to see our latest updates. We encourage you to view our NEW! MLS OPTIONS. You can search for additional properties that are listed by other Realtors as well as those listed by Cheney Realty, Inc. We also provide additional tools for both buyers and sellers. Some of the properties listing on our site are also "Featured" on the Multiple Listing Services pages. This feature opens in a resizable popup window, just close the window to return to our site. We hope you find these additional features helpful and convenient. We love to show our pride in our region. Visit the Our Region pages to take a brief photo tour of a few communities and areas of interest in and around Cheney Washington. We also provide links to recreation, businesses and civic sites we think you'll find useful and interesting.